Important note: Passengers with no seat reservations will not be allowed to board any of the N’EX trains. Please, make sure to reserve your seat before boarding. Furthermore, all passengers must follow the instructions and seat indications, written on their reservation ticket. Similar to most trains, Narita Express uses a separate railway, which means traffic never blocks it. The train offers beautiful views to and from the city, as the airport is located outside of Tokyo area. Snack cars inside the trains pass by at regular intervals, offering tasty and affordable Japanese appetizers and drinks. Facilities on the train are well maintained and spotless – in the true Japanese spirit. Narita Express trains offer luggage space and areas where you can lock your bags. Each separate seat provides a rather large seating area, which can also be used for placing your all luggage just before you. Besides, overhead compartments above each seat are also available. The N’EX has two stops in Narita Airport, Terminal 1 and Terminal 2-3. The routes are marked in red in the following map. N’EX trains take approximately 1 hour to get from and to Tokyo Station (first stop city center), 1 hour and 15 minutes to Shibuya Station and around 1 hour and 20 minutes to Shinjuku Station. The service operates 27 trains daily, which allows for the regularity and punctuality of the service. 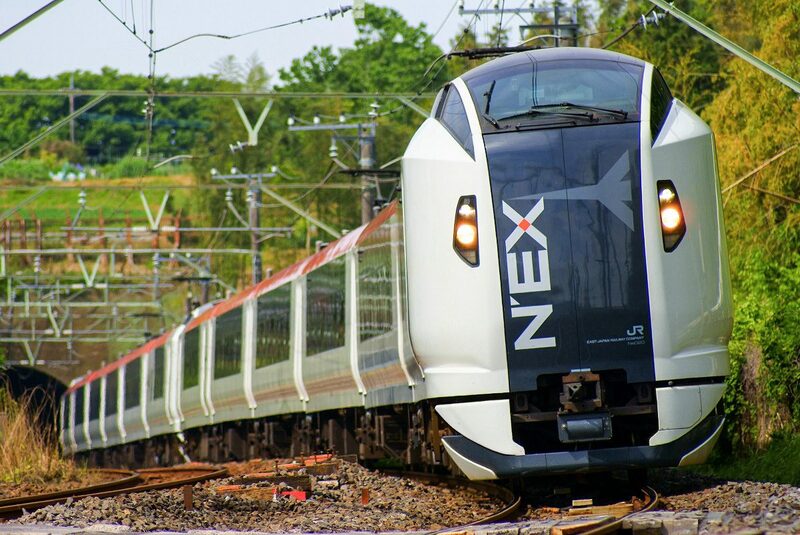 All N’EX trains anew their journey from Tokyo or Narita Airport every 30 minutes. Please refer to the JR East schedules page to check the latest schedules from and to Narita Airport. There are two types of N’EX tickets: for Standard and Green Cars (First Class, similar to the Japan Rail Standard and Green class tickets). The price for each class is different (detailed below), however, the standard seats are extremely comfortable and spacious. All N’EX seat reservations are available for free to any Japan Rail Pass holder. The airport transfer service is part of the many benefits the JR Pass has to offer. Holders can reserve a seat at any JR ticket office in Narita Airport, before boarding the train and without any additional payment. Moreover, there is no limitation to the number of times a JR holder can use Narita Express, whereas other transportation cards like SUICA, are not valid for the service. Keep in mind that the Keisei Skyliner service, an alternative transportation from Narita Airport to Ueno Station, is also not included in the JR Pass. Round-trip ticket fares are usually around 33% off two single trips. Please refer to JR East page for further information. I want to book the roundtrip NEX promo. On the way back to Narita (from Tokyo Station), how do I book my reserved seats on NEX? Hi, my visit to Japan will be a 8 day trip. Plan to purchase the 7 day pass. on my last day, can I still use (book) the Narita express for free since i have JP pass. (arrive Japan on the 7th morning and leaving on the 14 evening). Hi Gigi! The Japan Rail Pass validity period is calculated in days, not in hours. Therefore, if you have purchased a 7-day pass and your activation date (when you first use the pass) is the 7th, the exact expiration time will be midnight on day 13. On 14th your Japan Rail Pass won’t be valid and hence you won’t be able to travel making use of it. Happy travels! Hi! I just want to inquire. If I have already JR Pass and I will ride Narita Express. Can I book my seat reservation on the spot? For example, we will arrive on April 6, 11:35AM. We can reserve seat for the N’Ex departure at 12:00PM? Thank you! Hi Elaine! Yes, once your Japan Rail Pass is exchanged you will be able to book your seat in the next NE’X available. Happy travels! Hello, I am going on a trip that will cover 15 calendar days. If I want to use the JR Pass to ride the Narita Express when I arrive, do I have to activate the pass on that day? If so, does that mean I cannot use the pass on my return to the airport and must buy an individual ticket? Hi Nathan! Your Japan Rail Pass has to be exchanged and within its activation period to be able to make use of it. Happy travels! Does the Narita Express return ticket have to be used within 14 days of the first trip? I read on a JR web site that there is a validity period of 14 days ,what does that mean exactly? Hi Maryanne! The Japan Rail Pass can have a validity of either 7, 14 or 21 consecutive days. During the validity scope you will be able to ride all the included transportation at no additional cost, however if you wish to travel when your pass is no longer valid you will have to pay additional tickets since your pass won’t be of use. Happy travels! We will be arriving in Tokyo on January 29th, once at the airport we will have our JR voucher (Exchange Order) be exchanged at the JR office in Narita airport. We’re planning on using the JR pass (7 days) on the 31st of January to go to Osaka. My question is, will we be able to use our JR pass on the 29th of January going to Tokyo from Narita by Narita Express (N’EX) even though we will have the JR pass be used on the 31st for our Osaka trip? By the way, we will be returning to Tokyo on February 7. Are there gonna be problem like, my 7 day pass will not be enough? Thank you. Hi Mari! The Japan Rail Pass validity period is calculated in days, not in hours. Therefore, if you have purchased a 7-day pass and your activation date (when you first use the pass) is the 29th of January, the exact expiration time will be midnight on February 4. All trips you make using the pass will be counted as use days. Happy travels! Could you please share NEX Express schedule / timetable from Ikebukuro Station to Narita Airport ? Thank you. Hi Lee! Please refer to the JR East schedules page to check the latest schedules from and to Narita Airport. Happy travels! Need cost difference for adult pass or individual train tickets please. I plan to go to Osaka from Tokyo on March 20th around 2:00 pm, and leaving Japan from Narita airport on March 26th at 6:30 pm, do I need the 7 day pass or 14 day pass? thank you. Hi Charlin! The Japan Rail Pass validity period is calculated in days, not in hours. Therefore, if you have purchased a 7-day pass and your activation date (when you first use the pass) is the 20th of March, the exact expiration time will be midnight on March 26. The 7-day pass should be enough. You refer persons inquiring about schedule of operations for Narita Express to the JR East Schedule however that schedule does not show the beginning and ending time of operation. I need to arrive at Narita Airport by 7:30am. Is there a 6am NEX train from Shinjuku Station? Hi Mark! The website with the N’EX operatin hours is properly linked in this article. As you will see, first train in the morning from Shinjuku Station to Narita Airport is at 05:55h. Happy travels! I would only need an airport transfer from Narita airport to Shinjuku and vice versa. Will the train stop at Shinjuku station? What ticket should I purchase and where? May i know will keisei skyline stop at aoto station? How to book? May i know will N’EX stop at Narita city station? Taking from Tokyo to Narita city station by N’EX. How long? Hi Miko! All the stations of N’EX are listed in this article 😉 Please refer to the JR East schedules page to check the latest schedules from and to Narita Airport. Hi! I will have a Japan Rail Pass, and plan to travel from Tokyo Station to Narita Airport via N’EX. I understand that I will need a Seat Reservation. My question is, can I make the seat reservation just right before boarding the Narita Express? Or must the seat reservation be made in advance? Hi Pemberley! Yes, you can do the seat reservation just before boarding the train. Enjoy your stay! Our JR pass will be expire on the 9 October. Can we somehow I extend our JR pass until 12 October, so we can catch the train to Narita International Airport on the 12 October @10:00 to fly home. Hi Nghi! Once you purchase your JR Voucher, you cannot add extra days. And once you exchange it for the for the actual JR Pass and activate it, you cannot modify its validity period in any way. If you wish to extend your JR Pass, you will need to purchase a new one. JR Pass cannot be extended by 1,2, or more days. Happy travels! Hi there! I will be going to Japan next year. I am sooooo excited, but a little anxious about getting around. This is what my itinerary looks like so far. 1. Should I do the 7 day pass or 14 day? 2. Am I able to go to Kobe with the pass from Osaka? 3. When should I activate my pass? 4. Do I always need to book my seats in advance? Even from Narita Airport to Toyko? 1. For your itinerary, the 14 day JR Pass would be really convenient as it includes transportation in Tokyo, Kyoto and Osaka, as well as the trains to Hakone and Tokyo Disney. 2. Yes, transportation to Kobe is also included! 3. Please check our FAQ about the JR Pass activation. 4. There is no need to book your seats before arriving in Japan. However, we recommend that, after activating the JR Pass, you go to the seat reservation counter to book the trains that suit you the most. If our itinerary is for 15days, do we need 21 days ticket, is it worth it or is it better just to top up the 14days ticket with one way N’EX ticket from Tokyo to Narita? we’ll be staying the last 5 days in Tokyo. Hi, I’m planning my trip to Japan , and I was thinking to get to the airport to Osaka first, next day going to Kyoto, spend there a couple of days and then going to Tokyo for 4 days: comeback home from Narita airport, is it worthy to buy the JR pass ticket for just a few trips :(osaka airport-osaka, osaka-kyoto, kyoto-tokyo and tokyo-airport)? because I can’t use it for travelling in the city by metro or bus, right? also I saw that UENO to narita airport trip by NEX (NARITA EXPRESS) is not included in the jr pass, so how much is the trip? Regarding your last question, from Ueno Station you should head to Tokyo Station, where you can get the Narita Express to Narita Airport. The full trip is covered by the JR Pass. Can I use JR Pass Regular from Tokyo to Osaka to Nara to Kyoto and back to Tokyo? I have 5 days to do this travel plan. Hi ACA! Yes, you can use your Japan Rail Pass to reach all those destinations. Happy travels! where do I buy a ticket to go to Tokyo station by NEX. Hi, I am planning to go Nagano from Yashio city and I am thinking of getting a JR east pass. I would like to know if I can use the pass to get us back to Narita international airport? 1. Can I book the Narita Express to go to the airport as I will be leaving from Narita Airport when I land in Fukuoka once I land in Fukuoka without activating the pass? Can I also book the Hello Kitty Shinkansen from Hakata to Shin-Osaka and reserve seats already when I exchange the pass even if I choose to activate it on the 3rd day only? 2. Can I exchange the pass when I first land in Fukuoka but active date starts on the 3rd day so I can still use it until my last day in Tokyo for the Narita Express? 3. Is it better to visit Mt. Fuji using this JR pass? If so, I will go on my way to Tokyo, however, we have luggages, are we allowed to bring our luggages with us in and out of the trains in between and is there any storage place perhaps to keep our luggages first given our last stop will be in Tokyo but we just want to visit Mt.Fuji (Hakone or the Lake) just to see the Mt.Fuji? 4. Can I use this JR pass to travel from Fukuoka to Osaka then from Osaka to Tokyo and then when in Tokyo, to other places around Tokyo? Appreciate your soonest advise so I know what type of pass to purchase, am really confused, thanks so much! You will be able to reserve your seats once your Japan Rail Pass is exchanged, even if you are outside of its validity period. You can exchange your pass and set the activation date anytime within the following month. Travellers are allowed luggage on board at Shinkansen bullet trains for no additional cost. There is a delivery service option too. My partner is arriving at Narita Terminal 1 at noon and I am arriving at Terminal 2 at 3 pm. Can my partner exchange the voucher at Terminal 2 after I arrive so we can do it at the same time and make the reservation for the NEX train to Tokyo? Hi Glen! Sure, the voucher can be exchanged at any of the JR Exchange Offices. However since the duration is counted in days (not in hours) she can exchange it before and would still have a valid Japan Rail Pass until the same day as yours. Happy travels! hello! do we buy the tickets in the airport when we arrive? Hi Ava! The Japan Rail Pass be will sold at a higher price and on a trial basis in Japan from March 8, 2018 through March 31, 2019 at major stations and airports. However it is recomended to purchase it from official vendors such as http://www.jrailpass.com to get a better price and to be able to pay in your own currency, plus to avoid long queues. Hello. I’m flying in to Tokyo October 9, 2018 @ 4pm. I’m going straight to Kyoto for a few days then coming back to Tokyo as I’m leaving from Narita on October 16, 2018 and will be at the airport around 8am. If I purchase my 7-day starting October 9, will I be able to make use the Narita Express on the morning of the 16th? Also if I’m taking the Narita Express to Tokyo then taking the bullet train to Tokyo which stop should I get off for that? Hi BO! The Japan Rail Pass validity period is calculated in days, not in hours. Therefore, if you have purchased a 7-day pass and your activation date (when you first use the pass) is the 9th of October, the exact expiration time will be midnight on October 15. I‘m planing on traveling from Kyoto to Hiroshima and then from Hiroshima to Tokyo. I know that the Rail Pass is not valid on the bulletin train. Are there any trains running or do I have to pay the full price for the bulletin train? Or just an additional fee? we have JR Passes and go home tomorrow. please informations about reservation Narita Express. we need to use N’EX 7-7:30AM. Is possible make seet reservation a few minutes before taken Narita Expres and where? Is there direct train to shibuya station? Hi Aini! Yes – as you can read in this article, the Narita Express has a stop at Shibuya Station. Japans Rail companies are amazing. Hi, we will go to Japan on May 23-26. Is the Japan Rail Pass sufficient to go around Tokyo and nearby areas? or is there other cheaper tickets because we will be there for 4 days only? The Japan Rail Pass is aimed for those wanting to travel around the whole country. Should you plan to only stay in Tokyo there are other cards that can be more cost saving such as SUICA or PASMO. Yes you can! For most of the trip at least. Please check our Mount Fuji page for more information. I’m hoping you could help me out with a few questions. I’ll be in Japan for 10 days, arriving in NRT, and going to Osaka, for 3 days, Kyoto for 3 days and spending the last 4 days in Tokyo. 1) Will a 7 day pass be sufficient? Are there passes I can purchase to cover my last 3 – 4 days in Tokyo without having to buy the 14 day JR Pass? 2) I will be ordering my pass online, but exchanging the voucher at the airport. Is this possible? Do i need to reserve my seat on the NRT Express after I pick up my pass? Should you want to purchase a 7-day Japan Rail Pass, you can make use of a PASMO or SUICA Cards to move around Tokyo. That would be good since the pass is more cost effective the more you travel so if you cover the longest distances with the pass you can save money by purchasing a cheaper card for the days you don’t need to travel long distances. As specified in this article, all N’EX seat reservations are available for free to any Japan Rail Pass holder. Holders can reserve a seat at any JR ticket office in Narita Airport, before boarding the train and without any additional payment. We hope you have an amazing time in the land of the rising sun! We are planning to go on 9 April from Tokyo to Kawaguichi-ko, and the next day leave Kawaguichi-ko to Kyoto. May I ask you what would be the most effective train route from Tokyo to Kawaguichi-ko and from Kawaguichi-ko to Kyoto? Thanks! From Shinjuku Station in Tokyo, take the JR Chuo Line to Otsuki Station. There, transfer to the Fujikyu Railway Line to Kawaguchiko Station. This trip takes just under three hours. Regarding the activation of Japan Rail Pass, after exchange of the temporary voucher to the Jr ticket office in the airport can I immediately use my JR pass on that day? I wanted to use it when I arrive in airport to go to Shinjuku? Yes, you can start using your Japan Rail Pass the same day you exchange it. You will just need to set that day as the activation date upon exchanging at a JR Exchange Office. I’ll be coming in from Osaka but my outbound would be Narita. If I purchase my 7-day starting June 13, will I be able to make use the Narita express on the morning of the 20th? The Japan Rail Pass validity period is calculated in days, not in hours. Therefore, if you have purchased a 7-day pass and your activation date (when you first use the pass) is the 13th of June, the exact expiration time will be midnight on June 19. Therefore you would not be able to use the pass on the morning of June 20th. We will travel to Japan in May and arrive at Narita about 4:30 pm. We will purchase the voucher online and exchange for the JR Pass. 1. Please advice of train stations and lines from Narita airport to the Azabu Juban station. 2. Please advice of train stations and lines from Azabu Juban to Ashikaga flower park. 3. Please advice of train stations and lines from Azabu Juban to Hitsujiyama Park in Chichibu. 4. Please advice of train stations and lines from Azabu Juban station to Shin-Fuji station of the Tokaido Shinkansen line. 5. Please advice of train stations and lines from Shin-Fuji to the Kyoto station of the Tokaido line. 6. Please advice of train stations and lines from Kyoto station to Osaka, near the Osaka Castle. I will be in Japan March 14-28. However, I would like to purchase the JR pass for 7-days (from March 21-27) because those are the days I will be travelling round trip between Tokyo to Kyoto on the Shinkansen. My question is, if I purchase the JR pass for March 21-27, can I still use the Narita Express on March 14 and 28 to/from the Airport? Or is the NE’X by JR pass only inclusive of those 7 days? Your pass will only be valid during your selected dates. That is, if you are travelling with a 7-day Japan Rail Pass and intend to use it from 21st March to 27th, you won’t be able to take any transportation with the pass outside those days. Should you need to take the Narita Express outside the validity period, you will need to pay for it separately. I am traveling to Japan and i’ll arrive in Narita airport terminal 2 on 19 of may. I’m only staying for 15 days. I’m traveling from Tokyo>Hiroshima>Osaka>Nara>Kyoto>kanazawa>Nagano>Takayama>Mount Fugi>Tokyo, this is my travel plan. Can i use the japan rail pass in all this places? Or is not included for all of them? I will get the 14 days pass. How can I search the schedules of the diferents trains on the diferents palces? If you want to see schedules of the trains we strongly recommend you to check Hyperdia, which offers detailed timetables, platform information, trip duration and exact distance, which will help you greatly in organizing your trips in Japan. – First, you can use your JR Pass to take the Sanyo Shinkansen line’s Hikari bullet train from Tokyo Station to the Shin-Osaka Station. You will then transfer to the Sakura train (on the same line) and arrive in Hiroshima at Hiroshima Station. – To get to Osaka from Hiroshima, just take the Sanyo Shinkansen line (westbound, Hikari trains) to Shin-Osaka Station. – Begin your trip from Osaka to Nara at the JR Osaka Station. Take the Yamatoji Rapid Train to JR Nara Station. – To get to Kyoto from Nara, take the Yamatoji Rapid Train from JR Nara Station. – To get to Takayama, from Shin-Osaka Station or Kyoto Station, take the Hikari or Kodama trains on the Tokaido Line to Nagoya, then take the JR Hida Limited Express (also known as Wide View) from Nagoya to Takayama. Kanazawa, nestled between the mountains and the Sea of Japan, is often the next stop for many tourists to Takayama. – Mount Fuji area is easily accessible with your Japan Rail Pass too, and it is also well connected to Tokyo for the last part of your trip. My partner and I will be arriving at Narita on April 23rd and will intend to be in Japan until March 14th. During our 21 day holiday, we intend to travel from Tokyo to Mt Fuji (Fuji Q), Kyoto, Nara, Osaka, Kobe, Naoshima, Hiroshima, Nagasaki (fly to) Okinawa (fly to) Sapporo & Hokkaido then fly back to Tokyo. What will our best options be in terms of JR Passes and other tickets required to travel between these cities? – Transfer from main airports to city centers (Narita Express to central Tokyo, as you have already learned in this article you are commenting). – Transportation within Tokyo, included lines are the Yamanote Line, the Keihin-Tohoku Line, the Rapid Chuo Line, the local Chuo-Sobu line and other metropolitan lines that circulate on the outskirts of the city such as the JR Keiyo, Musashi, Nambu and Yokohama lines. – The journey from Tokyo to Mount Fuji via Gotemba is almost fully covered. – Transportation between Tokyo, Kyoto and Osaka is fully covered in the Hikari train in the Tokaido line. – To get from Kyoto to Nara, take the Miyakoji Rapid Train, on the JR Nara line to JR Nara Station. – When traveling from Osaka to Kobe using the JR Pass, you may take the Sanyo Shinkansen from Shin-Osaka Station to Shin-Kobe Station. – To get to Naoshima from Osaka, take the JR Sanyo Shinkansen Line from Shin-Osaka station to Okayama using either the Sakura or Hikari train. – To get to Hiroshima, you will just need to take the Sanyo Shinkansen line (westbound, Hikari trains). Once you are there we recommend you not to miss Miyajima. – The Kyushu Shinkansen will take you all the way to Nagasaki. It looks like you intend to make the last part of your trip by plane but please note that should you have not yet booked your flights, the Japan Rail Pass may be a cost-effective alternative since for example Sapporo area is well covered by it. I have seen an alternate route to Fuji-Q Highland from Shinjuku Station to Otsuki Station then change for the Fuji Express Line to Fuji-Q Highland. Is the Fuji Express line covered by the JR Pass or is that something I can purchase on the day? Also, when travelling by shinkansen, are the tickets fully covered by the JR Pass? I have seen ticket prices listed from $170 (AUD) from Shinagawa to Kyoto and wasn’t sure if that was an addition to the 21 day JR Pass we are hoping to purchase. What is the main difference between the ‘Green Pass’ and the basic JR Pass – does it cover more lines or faster trains? Thank you again for all of your advice! The Fujikyu Line (Fuji Express) is a private railway line, so the Japan Rail Pass cannot be used for this line. However you will be able to use your pass to travel from Shinjuku Station to Otsuki Station in the JR Chuo Main Line. The JR Pass is valid on the Kodama, Hikari and Sakura types of Shinkansen at no additional cost, but is not valid on the Nozomi and Mizuho classes. The Hikari and Sakura bullet trains reach the same top speed as the Nozomi and Mizuho trains, cover the same routes and use the same type of actual train, but have more stops along each route. The Green Pass stands for a First class ticket, which allows you to access the most comfortable and spacious seating areas on all Shinkansen bullet trains and certain fast lines. The Green Pass guarantees a spacious and comfortable seat in the air conditioned cars of all the JR lines. The only thing you need to do is book your seat for free. I may have counted the total days wrong for our trip. Will we be covered by the 21 day JR pass if we fly into Narita on April 23rd and leave Narita on May 14th? What is our best option if we are not covered? The Japan Rail Pass validity period is calculated in days, not in hours. Therefore, if you have purchased a 21-day pass and your activation date (when you first use the pass) is the 23rd of April, the exact expiration time will be midnight on May 13. What is our best option if we have no valid JR Pass on our last day? I am traveling to Japan and arriving in Narita next month. We are only staying 8 days. We are traveling from Tokyo>Osaka_Ikeda>Osaka>Kyoto>Tokyo. Is it cheaper to purchase a one way N’Ex ticket to go to Shinjuku from Narita airport instead of purchasing the 14 day JR rail pass? We plan to activate the JR rail pass when we go to Osaka. Also, what route would we take to go to Osaka_Ikeda (Cupnoodle museum)? Please note Narita Express ticket will only cover your N’EX trip while the Japan Rail Pass is a multi-use all-you-can-ride discounted rail ticket. It gives you unlimited access to all Japan Rail National trains, as well as JR bus services, ferry services, and airport transfers. To travel with your 7-day Japan Rail Pass, means to have the unique opportunity to discover the whole country at a cheaper price than a Tokyo to Kyoto return ticket, on a Shinkansen bullet train. I amd coming to Narita Airport on Feb 10 and leaving from Tokyo by the same airport on Feb 20. I hava a 7-day JR Pass. Is it possible to get a round trip by The Narita Express with it? Yes, as specified in this article you are commenting the Narita Express is fully included in the Japan Rail Pass. You can make as many trips in it while your pass is valid. Please note the Japan Rail Pass validity period is calculated in days, not in hours. Therefore, if you have purchased a 7-day pass and your activation date (when you first use the pass) is the 10th of February, the exact expiration time will be midnight on February 16. Hi! I will be going to Japan and stay from March 4-8, basically that’s 5 days. I saw that I can purchase NEX Roundtrip Ticket as our house is in Hatagaya Station, he said we can take train to Shinjuku then take another to Hatagaya using Keio newline. Is this recommended? Is the card valid for 14 days? And unlimited pass to all stations for 2 weeks? Or how does it work? Thank you! The N’EX TOKYO Round Trip Ticket allows for round-trip travel in Ordinary Car reserved seats on the Narita Express. You will only be able to make a round trip between Narita Airport and Tokyo. For further details we recommend you to check the official website. bonjour j’ai acheté le pass national et je voudrais savoir si je peux l’utiliser dans tous les transports de tokyo (metro bus) ? Please read our dedicated article Getting around Tokyo with the JR Pass: Metro, trains and more for detailed information. My family of 3 will be traveling to Japan on Mar 31- April 7 and arriving at Narita airport around 9:10 P.M.
We are definitely getting a 7 day JR pass. Will there be a train from Narita airport to Tokyo around that time? Please advise! Its greatly appreciated and more power to you guys!!! Since Narita Express will leave you in central Tokyo, you will already be there for the first 3 nights of your trip. While in Tokyo, remember the JR Pass affords access to five different Tokyo railway lines: the Yamanote Line, the Keihin-Tohoku Line, the Rapid Chuo Line, the local Chuo-Sobu line and other metropolitan lines that circulate on the outskirts of the city such as the JR Keiyo, Musashi, Nambu and Yokohama lines. In case you want some suggestions on what to visit we recommend you our article “3 days in Tokyo itinerary and what to do“. To get from Tokyo to Osaka, you will need to take either the Hikari bullet train or Kodama from Tokyo or Shinagawa stations in central Tokyo. Both run on the Tokaido Shinkansen line, connecting the two cities. This train is the same you will need to take to visit Kyoto from Osaka: you will get between Kyoto Station and Shin-Osaka Station in less than 30 minutes. While you are in Osaka you will be entitled to make full, unlimited use of the Osaka Loop Line, which “loops,” or circles, through downtown Osaka. I am travelling to Japan on April. Please advise does the JR East Pass (Tohoku area) is valid on Narita Express? Or I need to buy a Narita Express round trip ticket as well? We are planning a trip from Narita Airport – Tokyo – Kyoto in a stretch to stay in Kyoto for 2 nights, then back to Narita for a conference for 2-3 nights, then to Tokyo for 2 nights before heading back to Narita Airport. Will the 7-day japan rail pass cover these routes from 21-27th of any month? Also, will the rail pass also cover trains to take us from Tokyo station to the Odaiba-Kaihinkoen station so we can visit Tokyo Joypolis? I’m sorry but I’m really confused about what sort of trains the rail pass actually entitles us to take around Tokyo. Also, if we purchase the green class rail passes, will that entitle us to the green class tickets for the hiker and kodama from Tokyo – Kyoto – Tokyo, as well as cover the Narita Express from the Narita Airport to Tokyo and back? Sinec we read you visit Japan to attend a conference first of all it is important you verify you are eligible to use the Japan Rail Pass: remember that the Tourist Visa is the only visa which allows you to obtain and use the Japan Rail Pass. The Green Pass will grant you access to first class seats on Hikari, Sakura and Tsubame trains on the Tokaido, Sanyo and Kyushu Shinkansen and any trains on the Tohoku, Yamagata, Akita, Joetsu and Nagano Shinkansen. So it will cover for the trips between Tokyo, Kyoto and Osaka. N’EX also offers Green Car (first class). Hi, I will be going to tokyo on the 21st of march for 8days, and i m thinking of doing a one day trip to kyoto and one day to mt fuji plus one day disney sea, can jr pass cover this 3 places and if yes ,can advise how to travel there as I am still very confuse with the train system. Lastly, can i use the jr pass in travelling around tokyo as the balance 4days i will be going nearby places of tokyo or do i need to buy a suica card. – To get from Tokyo to Kyoto with the Japan Rail Pass you should take the Shinkansen Hikari train from either Tokyo Station or Shinagawa Station in central Tokyo, and arrive at Kyoto Station. – To get from Tokyo to Mount Fuji you may want to take the Gotemba trail: take JR Tokaido line for Kozu from Tokyo Station, using your JR Pass. Once at Kozu (Kanagawa), take the JR Gotemba Line for Numazu and get off at Gotemba station. Once at Gotemba station, take a bus to Subashiri 5th station, the gateway to climbing Mount Fuji (the bus operated by Fujikyu, which is not part of the JR Group and thus thic ticket is the only part of the trip that is not covered by the Japan Rail Pass). – DisneySea is a twenty-minute walk from Maihama Station, or you can take the Disney Resort Monorail from Maihama to Tokyo Disney Sea Station. Use your JR Pass to travel from Tokyo Station to Maihama Station, on the JR Keiyo line. While in Tokyo, the JR Pass affords access to five different Tokyo railway lines: the Yamanote Line, the Keihin-Tohoku Line, the Rapid Chuo Line, the local Chuo-Sobu line and other metropolitan lines that circulate on the outskirts of the city such as the JR Keiyo, Musashi, Nambu and Yokohama lines. Should you need to reach any further location not covered by those lines you might be interested in travelling with a prepaid IC card. As stated in this article you are commenting, you can ride the Narita Express for free with your Japan Rail Pass. Regarding the validity of the pass, it is calculated in days. Therefore, if you have purchased a 7-day pass and your activation date (when you first use the pass) is the 23rd of February, the exact expiration time will be midnight on 1st March. Outside this validity window you won’t be entitled to use the pass. We hope you have an awesome trip. Hi…do I need to go to JR counter everytime if I am travelling within Tokyo for a ticket even though i have JR pass? When you travel with a Japan Rail Pass you won’t need to go to the counter everytime you are travelling if you take the included transportation. You will just need to go through the designated entrance and show you pass to the staff. Hello! Just wondering what the earliest NEX is from Tokyo Station to Narita Terminal 3 will be, we are planning to go to Sapporo during our holiday. Also, are we able to reserve the seat a few days before when we first arrive in Japan? Thank you! As described in this article, please refer to the JR East schedules page to check the latest schedules from and to Narita Airport. To reserve your seat, please go to any Ticket Office (Midori-no-madoguchi), located in all Japanese train stations. You can reserve your seats in advance as soon as you get to Japan. I am going to japan on Jan 19th/2018 . I try to get a around trip ticket from Express train ( Narita to shinjuku) and Shinjuku to Narita 3 days later. The question is: from the way return back to Narita . Please give me time table of Shinjuku station to Narita airport between 9:00am to 11:00 am on Jan 22/20118. I searched online but there are so confusion. Please refer to the JR East schedules page to check the latest schedules from and to Narita Airport, as described in this article. Hello, we are planning to go to the airport from Tokyo station to Narita airport Terminal 3 to catch a flight to Sapporo. Our flight is 9am, what is the earliest NEX we can take that will get us there in time? Where abouts in Tokyo station do we have to go to in order to get to the airport? Thank you! As stated in this article, Narita Express connecta Narita Airport to central Tokyo, making stops at Tokyo and Shibuya stations. Please refer to the JR East schedules page to check the latest schedules from and to Narita Airport. There are no train services to Shirakawa-go, but the Nohi Bus is available from Takayama. The trip lasts approximately one hour and is not covered by the Japan Rail Pass. Hi, my family and I are visiting Tokyo for 9 days. We are going to places by Harajuku, Akihabara, Shinjuku, Shibuya, Ikebukuro, Tokyo station, and more. I was wondering if it’s really worth it to purchase the 7 day JR Pass. If you and your family are planning on visiting just Tokyo, it would be avisable to compare prices on Hyperdia, which enables you to precisely plan your trip in Japan. However, getting the Japan Rail Pass will give you more flexibility to make sone day trips from Tokyo by train, since there is a countless number of towns and villages surrounding Tokyo, places that will leave you breathless, places full of history, heritage, and natural beauty, including Nikko, Kamakura, Yokohama and of course, the great Mount Fuji. how can i go from narita to takayama? Takayama is easy to access using your Japan Rail Pass. If traveling from Tokyo to Takayama, first take the JR Tokaido Shinkansen to Nagoya. Use the Hikari rather than Nozomi trains, as the Nozomi are not covered by the JR Pass. Alternatively, you may take the Hokuriku Shinkansen from Tokyo to Toyama. From either Nagoya or Toyama, take the JR Hida Limited Express to Takayama. Regarding the itinerary from Narita, should you be at the airport we would recomend you to take the Narita Express to central Tokyo and start your journey from there. Hi, we are travelling to Japan for 10 days and will arrive at Narita Airport. We plan to travel from Narita airport to kyoto for 3 days, Osaka for 3 days and Tokyo for 4 days. We have plan to purchase a 7 days JR Pass, what would be the recommended activation for the JR Pass?Should we activate on the first day or when we are leaving kyoto? Thanks. All of the mentioned trips are covered by the Japan Rail Pass. However, you might want to make day trips from Kyoto, visit places nearby Osaka or see places in the Tokyo outskirts. Our best recommendation would be to define the whole itinerary and check which are the individual prices of each trip in Hyperdia and then compare it to the cost of the natoin-wide Japan Rail Pass. Depending on your itinerary even the 14-day Japan Rail Pass might be cost effective! – From Narita Airport you can take the Narita Express as detailed in this article. – To move between Kyoto, Osaka and Tokyo you can take either Hikari or Kodama trains in the Tokaido Shinkansen line. I’ve already purchased JR passes for my family. I just wanted to know whether I should make a reservation in advance for the N’EX, or if I could reserve my seats at Narita Airport itself. It’s confusing, because I had read a rule that even if one is travelling on a JR Pass, he/she needs to collect their Reserved Seat Limited-Express Ticket before 9:00 p.m, on the day before departure. Secondly, I wanted to know where I could purchase the Tokyo Subway Passes, heard it’s really economical. Your response in this regard would be much appreciated. All N’EX seat reservations are available for free to any Japan Rail Pass holder who can reserve a seat at any JR ticket office in Narita Airport, before boarding the train and without any additional payment. Please note that passengers with no seat reservations will not be allowed to board any of the N’EX trains. How do you go to Hiroshima from Tokyo using the JR pass? How long is the travel time , because we only plan to go there for a one day trip and plan to go back to Tokyo on the same day. How about going to Kyoto on one day trip as well? You can use your JR Pass to take the Sanyo Shinkansen line’s Hikari bullet train from Tokyo Station to the Shin-Osaka Station. You will then transfer to the Sakura train (on the same line) and arrive in Hiroshima at Hiroshima Station. This trip takes approximately five hours to complete. Getting from Tokyo to Kyoto with the Japan Rail Pass is easy. You should take the Shinkansen Hikari train from either Tokyo Station or Shinagawa Station in central Tokyo, and arrive at Kyoto Station. A standard Tokyo to Kyoto trip with the JR Pass takes close to 1 hour and 40 minutes, taking the Hikari Shinkansen. We are travelling to Japan this Octobe, for six 6 days . If we buy JR Pass, is there an airport bus transfer under JR Pass from Narita to Shinjuku? Second, if we just take NEX thru JR Pass to Shinjuku, is it a long walk from the train station to our Hotel which is Sun Members Tokyo Shinjuku? Also, can we use the JR Pass from Shinjuku to Shibuya? And, can we also use JR pass from Shinjuku to Kyoto and then back ? Lastly, when we travel back to airport from Shinjuku to Narita, can we still use the same pass, as long as it is within the 7 day period from its first used? First, N’EX trains take approximately 1 hour to get from and to Tokyo Station (first stop city center), 1 hour and 15 minutes to Shibuya Station and around 1 hour and 20 minutes to Shinjuku Station. Second, the walk from Shinjuku station to your hotel is just 11 minutes away. Also, from Shinjuku to Shibuya you can use the japan rail pass using the Narita Express train again. Last, yes, you will be able to use the same pass to go back to the airport, as long as it is within the 7 day period from its first used. Hi, I am coming to Tokyo Narita on 11/17/17 at around 330pm, do you think it is possible for me to catch the 6pm train to Osaka? I am planning to stay in Osaka for 3 days then go back to Tokyo for 4 days then leave for VN. JR pass would be perfect for my trip right? I want to also do a day trip to Kyoto. The Narita Express – also known as N’EX – is the most convenient Tokyo city transfer from and to Narita International Airport, which hosts most of the overseas flights to Japan. N’EX trains take approximately 1 hour to get from and to Tokyo Station (first stop city center), 1 hour and 15 minutes to Shibuya Station and around 1 hour and 20 minutes to Shinjuku Station. The service operates 27 trains daily, every 30 minutes. Therefore, it shouldn´t be any problem for you to catch the train to Osaka at 6 pm. According to your itinerary, the best option for you is to buy a 7 days Japan Rail Pass, since traveling on bullet train twice makes this pass worth and a good value for money. Can I ride on the NEX on the 9th Oct 2017, if my activation validity of the 7 days JR Pass starts from the 11th Oct 2017? I am afraid you can´t do so. Your Japan Rail Pass will start working for 7 consecutive days, once you active it. Therefore, you won´t be able to use it before the activation date. Also, keep in mind that once you purchase your JR Voucher, you cannot add extra days. And once you exchange it for the for the actual JR Pass and activate it, you cannot modify its validity period in any way. We have purchased a 7 day JR pass for our 10 day stay during which we will spend 4 nights in Tokyo, 4 nights in Osaka and 2 nights in Tokyo before flying out from Narita on 22 October. Please can you clarify that we will only be able to ride the N’Ex for free on our outward bound journey to Narita? We don’t plan on on activating our pass until our 3rd day (15 October) in Tokyo before taking the Shinkansen to Osaka on the 16 October. You will only be entitled to use the Narita Express at no additional cost while your Japan Rail Pass is valid. All trips you make before its activation date will have to be paid a part. Hi! If we purchase the JR Pass and have it activated upon our arrival in Narita Airport, can we use it right away to ride the Narita Express? Yes, you can do it – just make sure to check the Exchange Offices opening hours as well as Sale Points opening hours. So I can use the JR pass from Tokyo to Mt Fuji?! And the pass, is it only available in the airport? Im confused now coz I read that we need to have it before arriving in JPN (Narita). Yes – you can use the Japan Rail Pass to travel from Tokyo to Mount Fuji. You will just need to take JR Tokaido line for Kozu from Tokyo Station, using your JR Pass. Once at Kozu (Kanagawa), take the JR Gotemba Line for Numazu and get off at Gotemba Station. Regarding on where to purchase the Japan Rail Pass, it is always adviceable to purchase it online from any official vendor like this one. Although it is possible to purchase it at certain points of Japan, its cost is higher and can only be paid in yens. Hi, we are going Japan on 17-Oct, will arrive at Narita Airport 0845hrs and transit to Osaka through Haneda Airport. We will only have 4hr30min for this transferring between Narita-Haneda Airport; include immigration clearance and check-in luggage at Haneda Airport. We are planned to get Japan Rail Pass. Please advise the safer way of this transfer between Narita-Haneda Airport by using Japan Rail Pass. Once you land at Narita Airport, you will be able to use your Japan Rail Pass in Narita Express. It will take you straight to Hamamatsucho in a little more than 1 hour, where you will also be entitled to take the Tokyo Monorail to Haneda Airport at no additional cost. Tokyo Monorail will take around 13 minutes. Please remember you will need to activate your Japan Rail Pass upon arrival at Japan (this can be easily done at Narita Airport). I am travelling to Japan next month. Could you please let me know if JR Tokyo Wide Pass is valid on Narita Express? Hi Anna! Yes, it is valid on the Narita Express. Hello, I will stay for 9 days and I will get 7 days JRP, the N’EX that is included is posible the lata day that I will be in Japan or it is only valid until 7 day like the JRP? 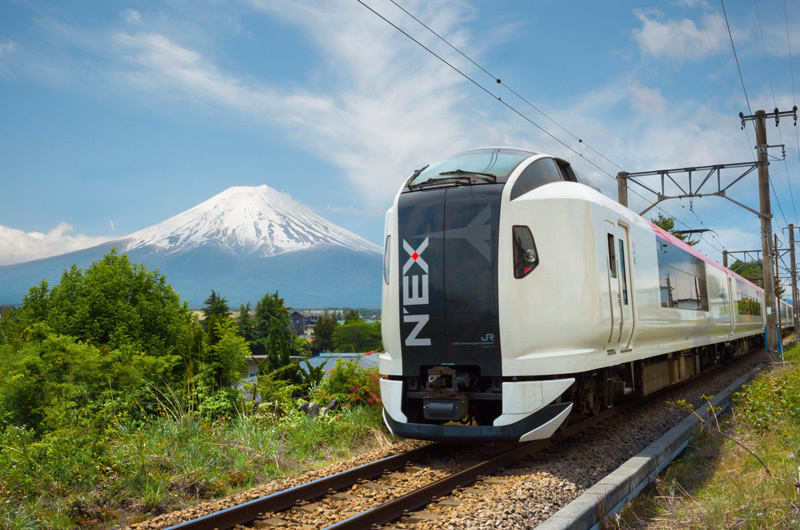 You can take the N’EX every day you want, but you will also be entitled to do it at no additional cost during the validity period of your Japan Rail Pass (during the 7 days it is active). Should you use it out of this scope of time, you would have to pay individual tickets for it. From Osaka we would like to take day trip to Kyoto and other surrounding and then back to Tokyo for 3nights before flying out via Narita Airport. Can you please help whether it’s worth purchasing 7 or 14 days JR Railway pass? And is their a direct Shinkansens line that will take us from Narita Airport to Osaka Dotonbori? Can you please help as i am so confuse. Hi im going tokyo from 29 march 2018 – 6 march 2018, my flight abit weird due to arrival in narita airport and going back home from haneda, originally plan is tokyo > osaka > kyoto > nara > mt fuji and some of the famous place that havent figure out..im very confuse about jr pass..not so sure want to buy JR pass or not…my trip is about 9d8n..the first day reach tokyo is already 5:30pm and would like to ask about JR pass can use in Tokyo metro? please give me some advice thank you very much! The Japan Rail Pass will fully cover the trips you mention. In case you decided to travel with it we would recommend you to purchase it online at http://www.jrailpass.com. – From Narita Airport to central Tokyo you can take the Narita Express. In this article you will find all the details on how to get it and where to get off. – While in Tokyo you can use 5 JR lines to move within the city: the Yamanote Line, the Keihin-Tohoku Line, the Rapid Chuo Line, the local Chuo-Sobu Line and other metropolitan lines that circulate on the outskirts of the city such as the JR Keiyo, Musashi, Nambu and Yokohama lines. – Tokyo, Kyoto and Osaka are connected with by the Tokaido Shinkansen line, included with the Japan Rail Pass. You can make as many trips as you want at no additional charge in this line. – In order to get from Kyoto to Nara, begin at Kyoto Station. Take the Miyakoji Rapid Train, on the JR Nara line to JR Nara Station. The rapid trains run twice per hour, and the 45-minute trip is covered by your JR Pass. – To go to Mount Fuji you can take the Kodama Shinkansen at Kyoto Station. Hi do you have 10 days option? I’m will be arrive Tokyo on 18 Nov and travelling to kyoto on 19 Nov for 2 days, Osaka on 21 Nov for 3 days therefore i need travel back to Tokyo by 24 of Nov. If i get the 7 days JR Pass and activate on 18 Nov, does it mean i still able to use it on 24 Nov travel from Osaka back to Tokyo? A Japan Rail Pass can be valid for either 7, 14 or 21 consecutive days, no other options are available. The Japan Rail Pass validity period is calculated in days, not in hours. Therefore, if you have purchased a 7-day pass and your activation date (when you first use the pass) is the 18th of November, the exact expiration time will be midnight on November 14th to travel from Osaka to Tokyo. Your JR Pass will be valid until the end of the journey. Hi, my family and I (7 adults, 1 child) will be traveling to Tokyo (Narita) June 25th-July 7th. It will be better to get the 7days or the 14 days JR Tickets?. Also, we are allow to go to the same city/place more than once?. Places we will like to go: Tokyo, Kyoto, Mount Fiji, the Hakone Onsen in Kanagawa, Hiroshima or Nagasaki. How many places I can go from Tokyo in one day trip? I am so exciting but also so confused. – Tokyo to Kyoto round trips. You should take the Shinkansen Hikari train from either Tokyo Station or Shinagawa Station in central Tokyo, and arrive at Kyoto Station. – Mount Fuji and the Hakone area can also be reached with the pass. – Hakone Onsen in Kanagawa is located only one hour from Tokyo. Take the Tokaido Shinkansen from Tokyo Station to Odawara. From there, you will have to use non-JR trains or buses to reach Hakone but main part of the trip will be covered for you. – To reach Hiroshima you can use your JR Pass to take the Sanyo Shinkansen line’s Hikari bullet train from Tokyo Station to the Shin-Osaka Station. You will then transfer to the Sakura train (on the same line) and arrive in Hiroshima at Hiroshima Station. – The Kyushu Shinkansen is a branch line that will run from Shin-Tosu to Nagasaki. If you are wondering what else you can visit in a day-trip from Tokyo, we strongly recommend you to read our article Best 5 day trips from Tokyo by train. It is full of good ideas on where to travel! Hi! Good afternoon. My family of 4 (2 Adult, 2 Children) are planning to go to Osaka ( 4 nigths) arrive at Kansai Airport, Kyoto (Osaka to Kyoto day trip), Mt Fuji (day trip), Tokyo ( 4 nights), we are depart from Narita Airport Would it be advisable for us to get the JR Pass? Please help me because I am so confused. 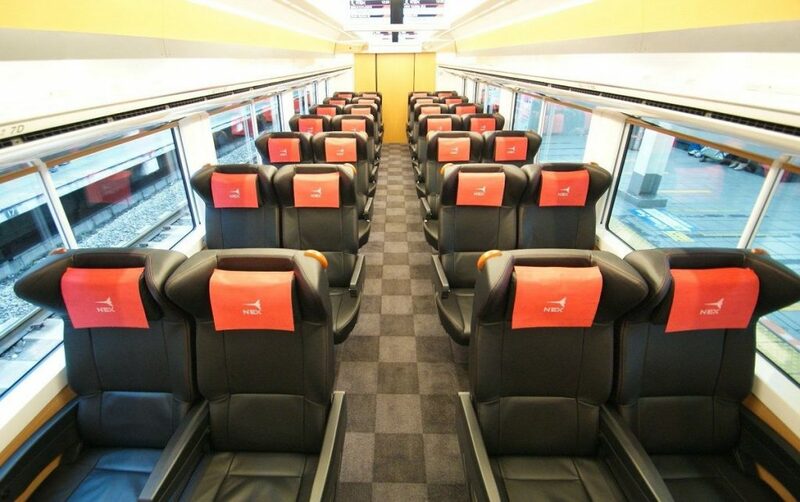 – It includes the Haruka Express, which will take you from Kansai Airport to Osaka at no additional cost. – The Osaka Loop line, which consists of an inner and an outer line, one running clockwise and the other, counterclockwise. – You will be able to freely and unlimitedly move between Osaka, Kyoto and also Tokyo. – Trip to Mount Fuji will be at no additional cost. – When in Tokyo you will be able to take many lines at no additional cost (special attention to the Yamanote line). – And last but not leat – you will also be able to reach Narita Airport through Narita Express since it is also included in the Japan Rail Pass. I am visiting from June 5 – 13 and will be staying in Tokyo near the Sky Tower. We are flying into Narita. Besides visiting the city we would also like to go to Kyoto. Would the purchase of the JR pass be best or would purchasing for those areas be more economical. The Japan Rail Pass gives you access to a wide range of fast-speed, rapid and local trains all over Japan, as well as many bus lines and selected ferry services. It is the most cost-efficient way to travel all over Japan for a limitless number of trips, restricted only by the selection of a time-frame. Choosing between 7, 14 and 21 days of JR Pass validity, you will be able to access any part of Japan and also have the opportunity to enjoy the world-famous Shinkansen bullet-train and travel with 320 km/h. You can get from Tokyo to Kyoto in 1 hour and 40 minutes, making it the fastest way to travel. You should take the Shinkansen Hikari train from either Tokyo Station or Shinagawa Station in central Tokyo, and arrive at Kyoto Station. Transfers from Narita Airport to central Tokyo are also included. I’m in Japan from 27th May (landing at Narita Airport) till 11th June 2017- which makes it 16days. The JR Pass is for 14days. I’m in Tokyo for 1st 4 days and the last 2 days. Which is the best recommendation to use the JR pass? As per your comment we recommend you to check our 14-day travel itinerary. Since your trip is a little bit longer and you mention you’d like to visit Fuji Kawaguchiko-machi too, please refer to our Mount Fuji itinerary to know how to visit the area using your Japan Rail Pass. Can you please advise which station is included in the JR pass (if any)? And if not, how can I transfer onto a different transportation system to get to one of the stations. Japan Rail Pass covers lines more than stations (a station may serve several lines). If you are looking for included trains, the Japan Rail Pass covers all JR Group limited express trains, express trains, rapid and local ones. Shinkansen bullet trains are also covered, except of NOZOMI and MIZUHO. Furthermore, the JR Pass can be used on the Tokyo Monorail, the Yamanote line (Tokyo Metro); the Aoimori Railway between Aomori and Hachinohe; the JR Ishikawa Railway between Kanazawa and Tsubata; the Ainokaze Toyama Railway beween Toyama and Takaoka; Narita Express from Narita Airport to Tokyo. If you want to look for the best itineraries included in your Japan Rail Pass we recommend you to check Hyperdia paying attention to filters as explained in our Hyperdia guide. My family will be entering Japan at haneda airport and then travel to atsugi. What’s the train route to get from haneda to atsugi naval base? What’s the train route to get from atsugi to Mt Fuji? From Haneda airport you can take the Tokyo Monorail, included in your Japan Rail Pass, that will take you to Tokyo city center. Once there you should look for a train that takes you to the closest station to Atsugi Naval Base, however please keep in mind this can be a long trip if you intend to take trains all the way. For futher insight on itineraries and train times we recommend you to check Hyperdia – the number 1 Japanese online transportation planning tool. Hi! Good afternoon. My family of 6 are planning to go to Osaka ( 4 nights), Kyoto ( 2 nights), Nagoya ( 2 nights), Tokyo ( 4 nights). Would it be advisable for us to get the JR Pass? Please help me because I am so confused. It will always depend on the kind of trip you want to make. If you plan to stay for long periods within a city, the Japan Rail Pass might not be the best option but if you are traveling around the country and making day-trips from Tokyo or Kyoto, for example, it should pay off. If you want to assess if the pass is the most cost effective ticket for your trip we recommend you to check Hyperdia – he number 1 Japanese online transportation planning tool. It will give you specific prices for each trip so that you can compare the cost to the Japan Rail Pass’ one. Hi I will be arriving at Narita and going to Tokyo. I am enquiring on can I purchase Narita express ticket on line in advance? Can I buy the ticket on board the train? Or is there ticket machine that I can buy the ticket. If I have to get the ticket from your ticket office and I may miss my train. Is there express queue for buying Narita express ticket? The Narita Express tickets cannot be purchased online unless you are a Japanese citizen and have a local bank account. Unfortunately, there are no ticket vending machines nor an express queue. In all other cases, you will be required to get the tickets from a JR ticket office, because the Narita Express has reserved-only seats, which means that you will book your seat in advance, before boarding. Regarding the Narita Express timetable – the trains run every hour.